The potluck dinner from the other night (where Oscar made some really nice chicken!) was followed by an AFS camp over the weekend. It was a camp for returnees who had just come back to New Zealand after their exchanges. It was great because most of the students we had seen just before they left, so it was awesome to see how much they'd changed and what their exchange was like. 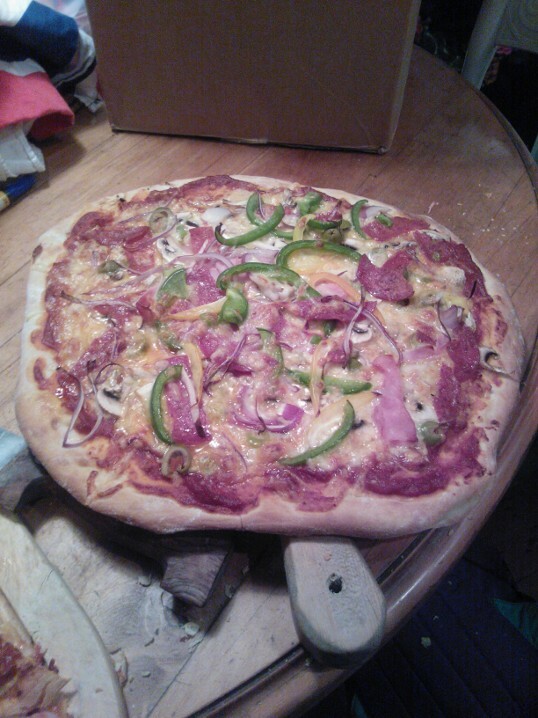 Everyone seemed to have fun weekend and we certainly had some fun making pizzas in the kitchen! I don't usually make bread or dough and if I do it's often in the breadmaker. But Cam (different Cam to my Cam, he's an orientation coordinator with Oscar) is really good at making bread without a breadmaker and he does it all the time. He even has pizza stones which we used to cook the pizza, so it was pretty hard out! The pizzas tasted really good and so did the sauce that Steph (another volunteer) made. All in all a pretty great weekend with some good food. Dissolve the sugar in the lukewarm water and then stir in the yeast. Leave this in a warm place to proof for 10 minutes. In a separate large bowl mix together the flour and the baking powder. When the yeast mixture is ready (puffy and foamy), add the oil to it and then pour the mixture into the flour mixture. Stir with a wooden spoon until the dough starts to come together. Tip the dough out onto a lightly floured surface and knead for 10 minutes, using more flour as necessary, until the dough is soft. Place the dough in a clean but oiled bowl and cover with a damp teatowel. Leave to rise in a warm place for 1-2 hours or until doubled in size. When the dough has risen, punch it down, remove from the bowl and separate it into two parts. Knead again until they are pliable and not sticky. Roll out on a lightly floured surface until you reach the size that you want. Then move the base either to an oven tray or a pizza stone and cover with the pizza sauce. Then add the toppings and turn the oven to 200°C on fanbake. Bake the pizzas for 10-15 minutes or until the crust is lightly browned and the cheese is completely melted. Chop the onions finely and fry in a small pot with some oil until translucent. Pour the tomato purée over the top, add the herbs and simmer for half an hour.